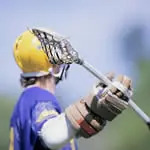 One of the most underdeveloped skills that we see in lacrosse players entering the college game from high school is shooting ability. Shooting ability is what separates a scholarship player from a walk-on for many coaches. By far, it is the thing we work on the most at Providence College with our new players. We break shooting down into three areas and, depending on the goal of a drill or task, we can work on one of the three, two of the three, or all three components at one time. For us, the three areas of shooting are; shot selection, shot placement and shot power. To build a shooting skill set, we try to build on the latter first, with the idea that we can facilitate selection and placement once the player has learned how to shoot with power. This article focuses on just that, developing shot power in time-and-room shooters. Shadow shooting is a drill that mimics the actual shooting mechanics but is done without a ball. Using shadow shooting allows a player to develop shooting footwork and motion without having the component of velocity or placement impeding his attention. For time-and-room shooting, we put a goal on the sideline facing the middle of the field and dissected by the restraining line. We have players stand on the restraining for a right handed shot by placing both feet on the restraining line with their left shoulder towards the goal. When they start their shooting motion for a right-handed shot, we ask them to drop their right foot behind the left foot, planting that right foot behind the line. This "crow step" as Chip Casto, assistant coach at Bergen Catholic (N.J.) calls it, allows the front shoulder to close so that the shooter's back is facing the direction of the shot. Once the right foot plants, the arms pull the ball forward in an overhand shooting motion as the player steps into the shot with their left foot. Once the task is perfected we start to teach them to whip their hands through the shooting motion so they can hear the whipping sound of the stick head against the resistance of the air, which shows stick head velocity. The last step in shadow shooting is having the player take multiple crow steps into the shooting motion, covering more ground and causing a louder whipping action.